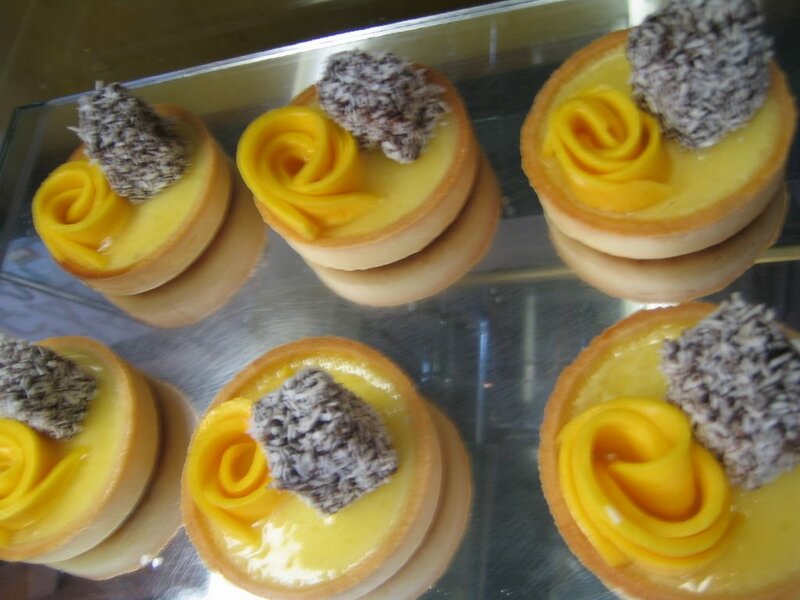 When I was working as the dim sum chef at Mu Du Noodles we used to make Chinese egg custard tartlets. Seems like evry country, every chef, every restaurant, and evry food blog has it's own favorite custard, and with so many types of custards in the world, I think that Chinese egg custard (炖蛋) really showcases the magic and simplicity of the way custard's ingredients combine to reveal the wonders of baking. The custard has three ingredients: milk, sugar, and eggs. For the Down Under Dim Sum Tart I baked the custard in almond sucre tart shells. 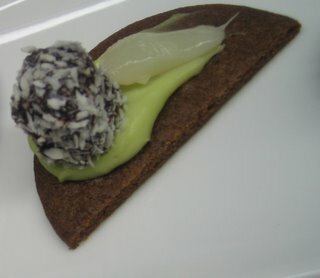 When cool I added an ultra thin layer of ginger lime mirroir. 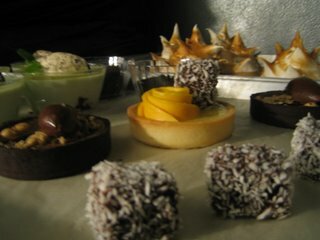 When the mirroir set I added ripe Manila mango and a mini lamington. whisk over a warm water bath until a little warmer that room temperature. Strain and pour into prebaked tartlet shells. bake for 20 - 30 minutes until edges set, but center is still slightly loose. Here is a down Under Dim Sum Tart chillin' with some friends. For a cool little snack I invented the lil' lamington petit four. A pandan leaf pastry cream smeared on a crisp ginger snap is topped with a lil' lamington and cool lychee fruit. The close up picture below is actually a lil' bite sized treat. With all the popular hip hop music out today talking about gettin booty, these fools need an old school sista like Roxanne Shante to tell them what time it is. MP3: Def Fresh Crew with Roxanne Shante on the mic and Biz Markie on the beat box.